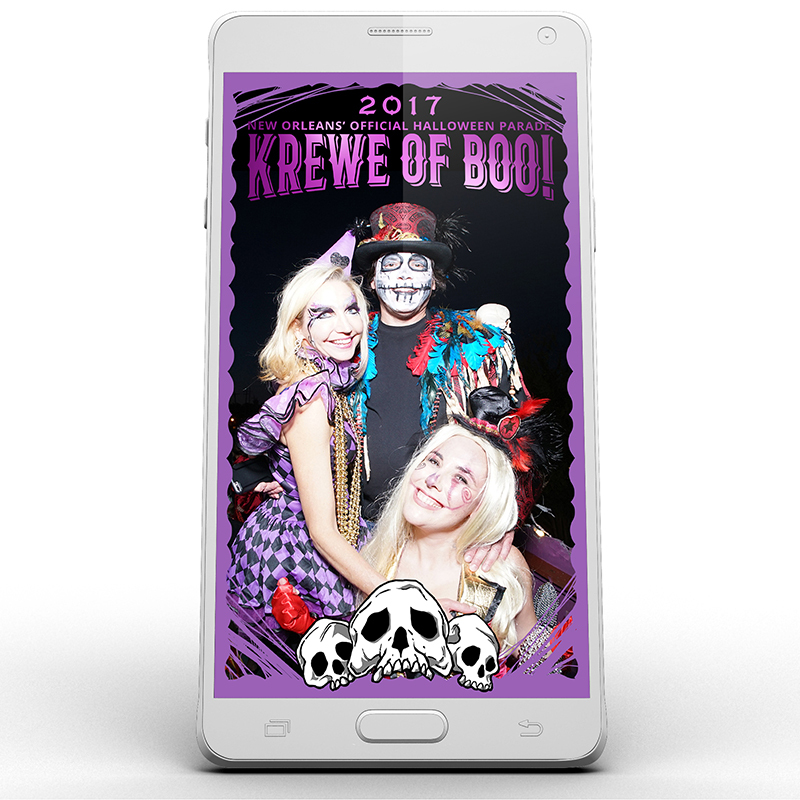 Every October during the weekend before Halloween, New Orleans erupts into a spooktacular frenzy of special events coordinated by Chief Spookster, Brian Kern, Captain of the annual Krewe of BOO! Parade, the one and only official Halloween parade in New Orleans. 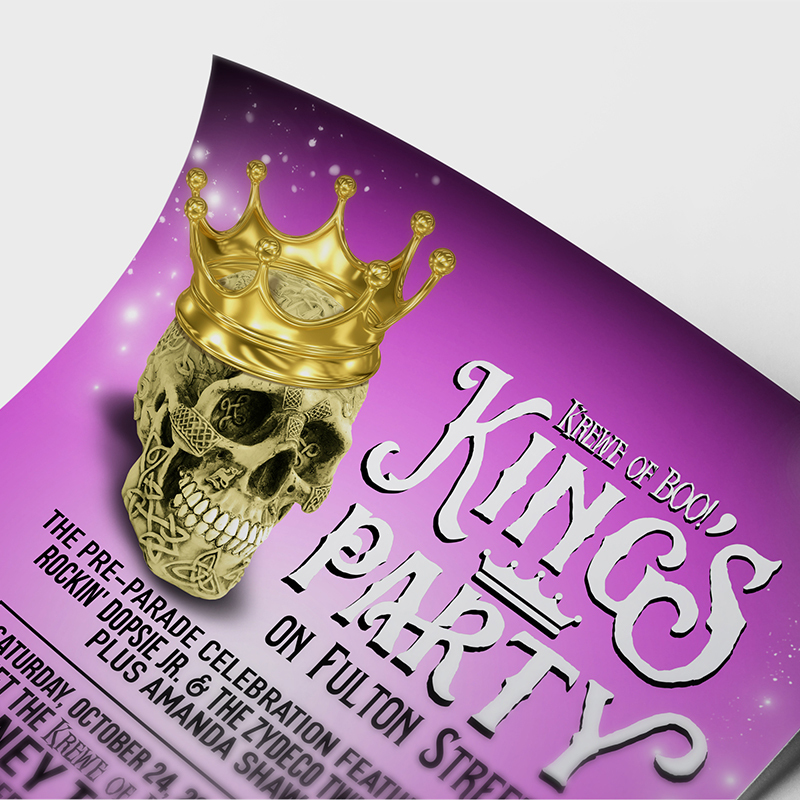 Since 2014, Midnight Boheme has been working alongside Brian Kern to design logos, throws, ads, videos, sponsorship presentations, postcards, flyers, social media campaigns, parade float signage, and much more! 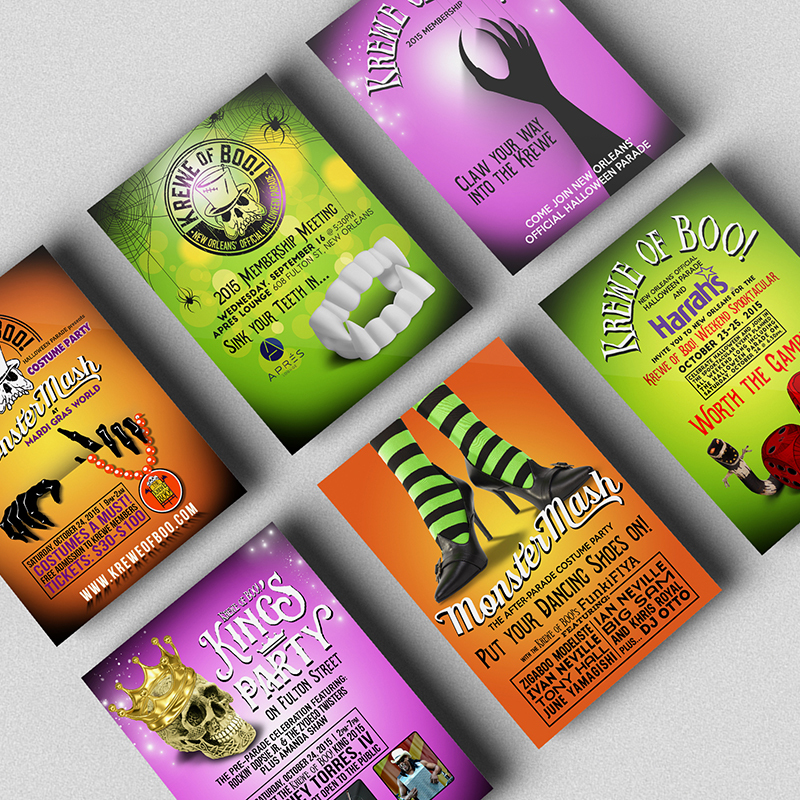 Here is only a sampling of the work created over the past 5 years for the parade. Brian Kern's family name holds much respect combined with local celebrity in New Orleans as his father is the founder of Blaine Kern's Mardi Gras World which creates and supplies the grand scale parade floats for Mardi Gras in New Orleans and the Mardi Gras celebration at Universal Studios in Orlando, Florida. 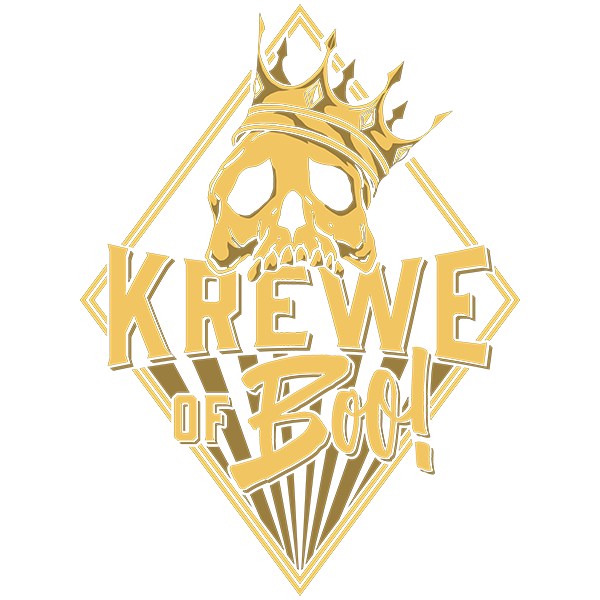 With the massive two-tiered floats as seen during Carnival transformed into Halloween-themes, the Krewe of BOO! parade is the only Mardi Gras-style parade still allowed to roll through the historic French Quarter. 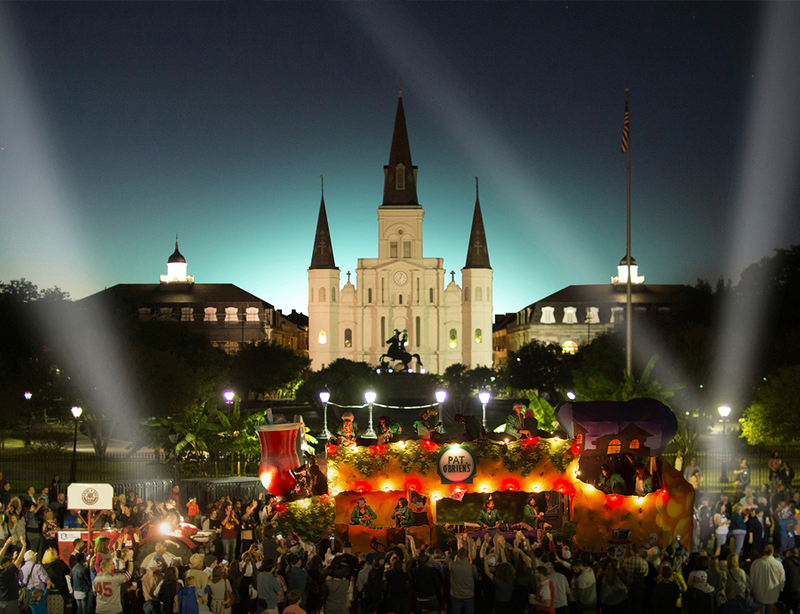 Beginning at Elysian Fields, the parade rolls at sunset and passes down Decatur in front of Jackson Square, up and around Canal Street, down Tchoupitoulas through the Warehouse District. 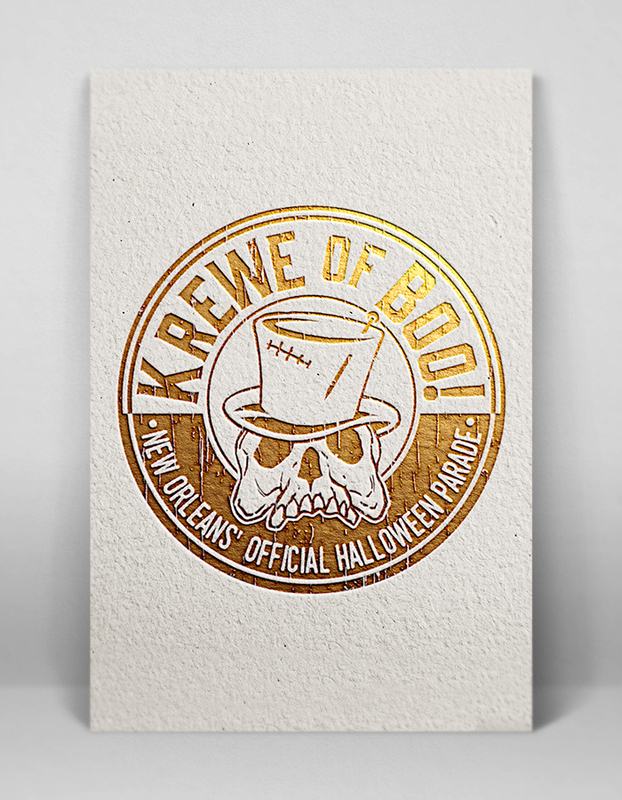 When Midnight Boheme first began working with Brian Kern on the designs for the Krewe of BOO! parade, a logo design had been created but was in need of a facelift. 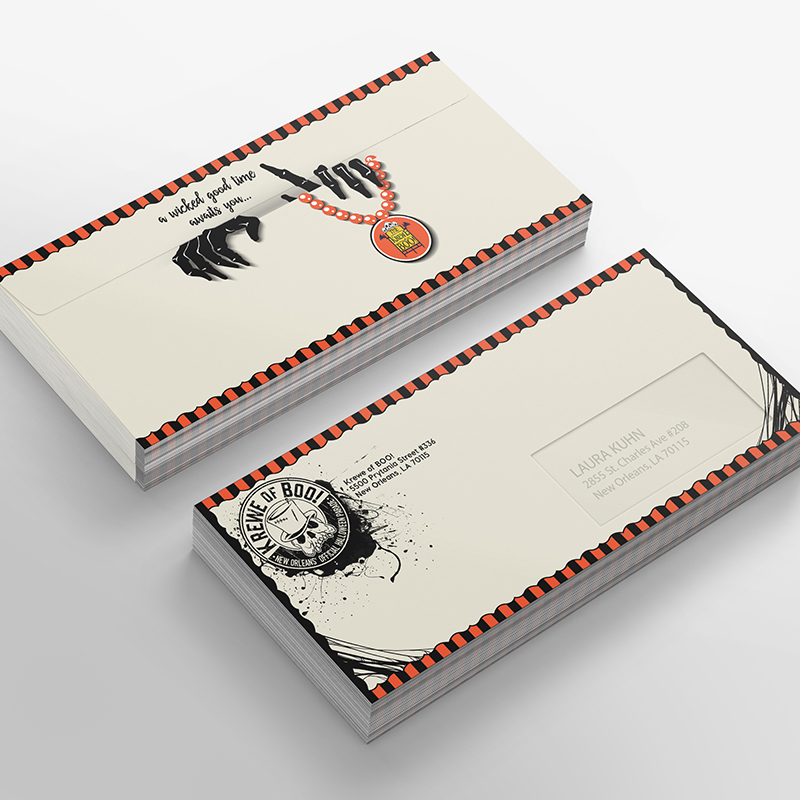 Inspired by Mr. Kern's annual costume of a skeletal-faced voodoo man, Laura Kuhn redesigned the logo as a round stamp-like emblem complete with the skull mascot in a voodoo top hat similar to the one Kern wears each year as he rides his famous Dracula float. 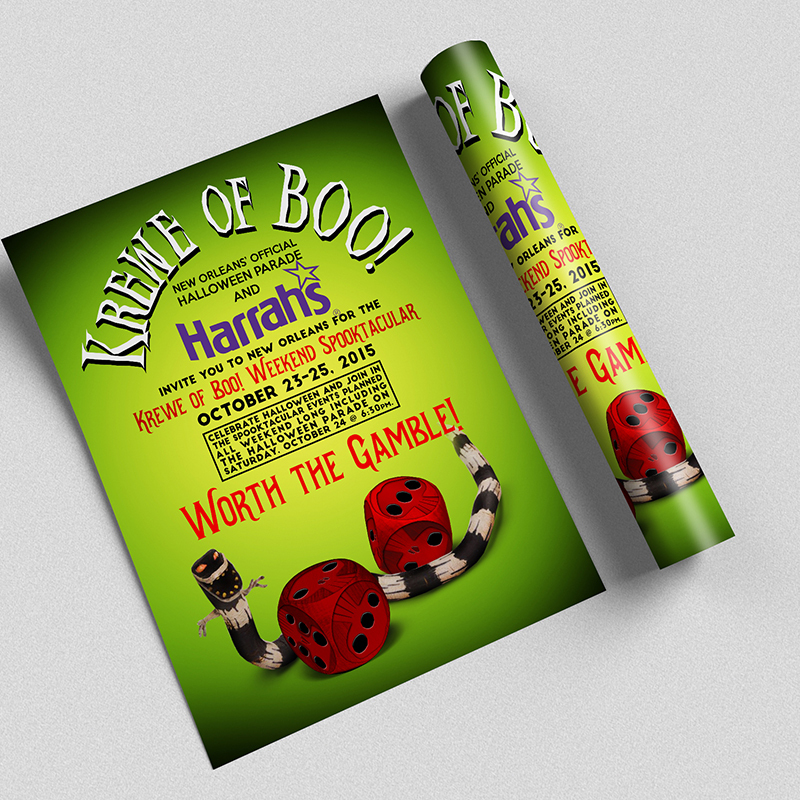 Several trifold brochures were created in 2015 to promote the weekend itinerary of events and to entice parade riders to sign up for the krewe. Using footage from several sources, Midnight Boheme edited several promotional commercials and inspirational trailers to post on social media and entice audiences to either join the krewe to ride in the parade or to encourage parade-goers to come out and enjoy the free show! Click to view the videos. Over the course of the past 5 years, Midnight Boheme has designed a series of logo designs for t-shirts, throw cups, medallions, hats, and other merchandise items either sold or given away at the parade. 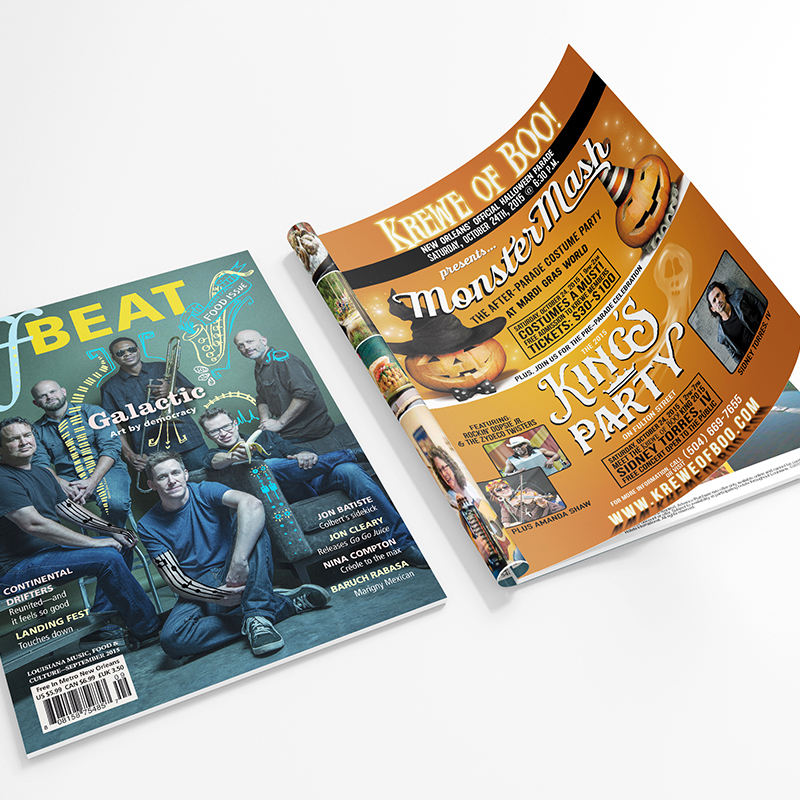 There is no end to the efforts of Chief Spookster Brian Kern who works tirelessly year-round in preparation for each October's giant weekend celebration. Midnight Boheme turns around a variety of advertising efforts in print and in digital formats to reach as wide an audience as possible. Over the years, the krewe has expanded and the crowds have swells to over 10,000 people the night of the parade. 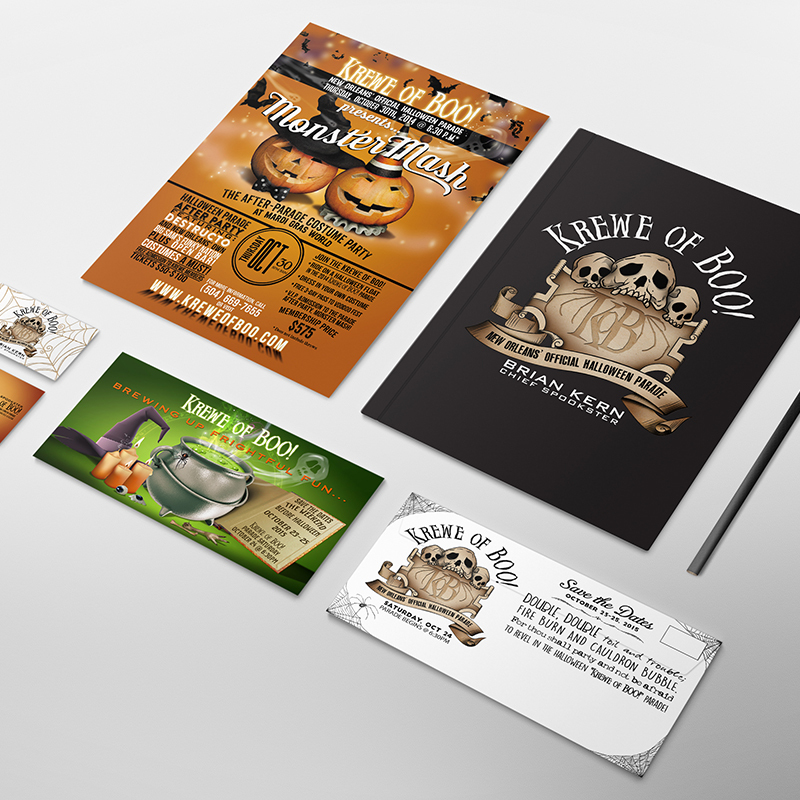 Business cards, envelopes, stationery, magazine advertisements, newspaper coverage, spotlight videos, postcards, flyers, signs.... you name it! 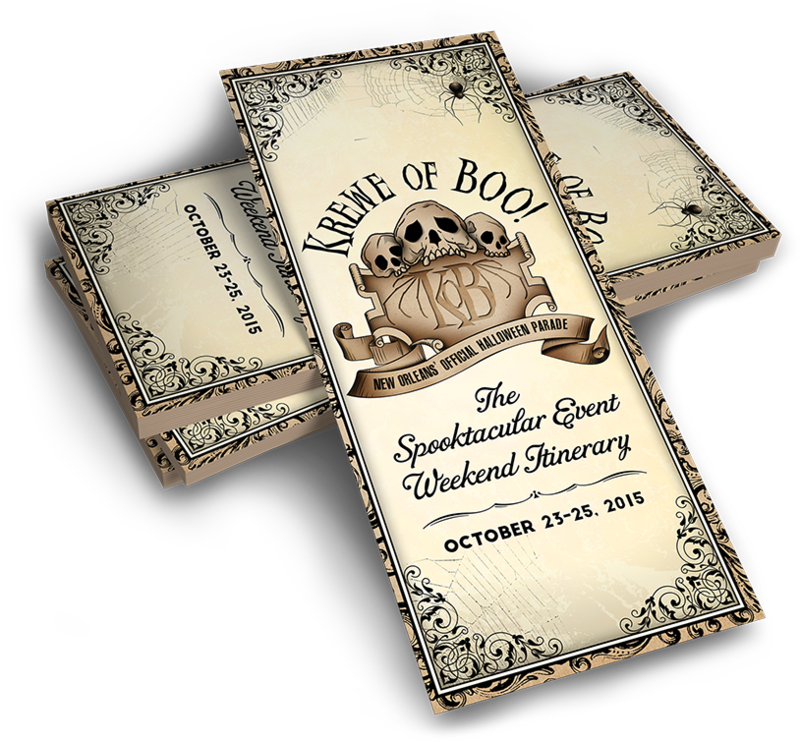 Krewe of BOO! stops at nothing to get the word out about its amazing parade and the numerous events during its weekend spooktacular! All images and content designed, created, and authored by Laura Kuhn | Midnight Boheme. © 2018 MIDNIGHT BOHEME, LLC. All Rights Reserved. 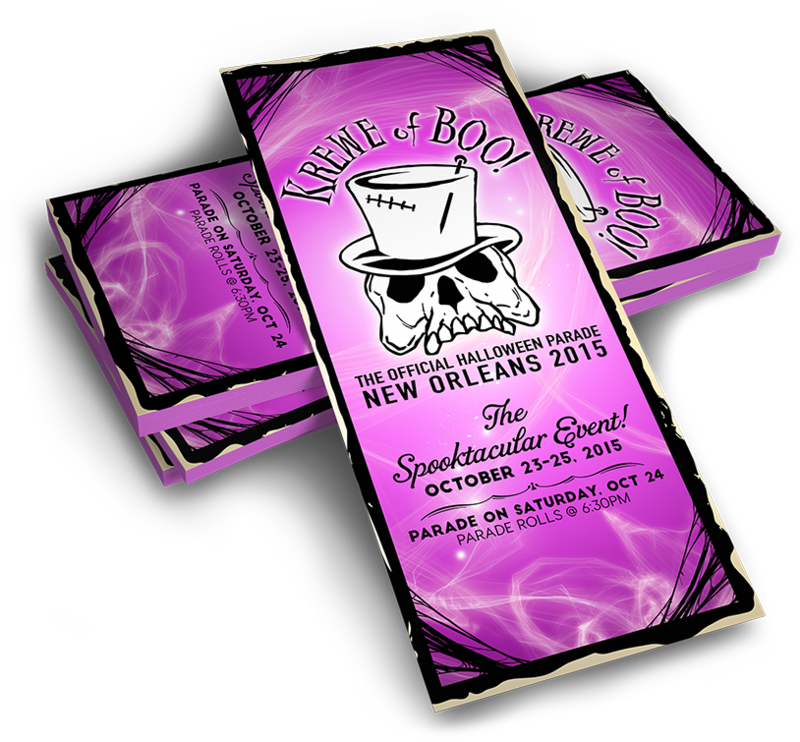 Immediately following the Krewe of BOO! parade, an adult costume party ensues. Entitled The Monster Mash, this post-parade costume celebration has been held at Mardi Gras World, Howlin' Wolf, and Generations Hall over the past few years. 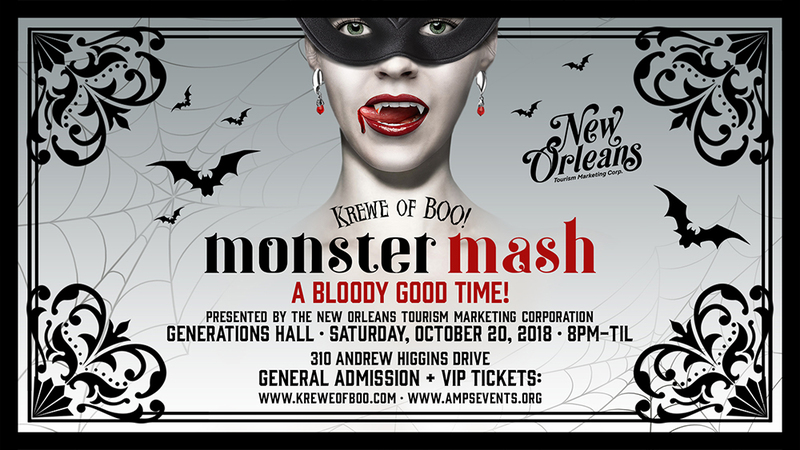 Always featuring live entertainment, food vendors, and cocktail specials, Monster Mash is a perfect way to complete the Krewe of BOO! experience by donning a Halloween costume, grabbing some friends and drinks, and dancing the night away into the wee hours! 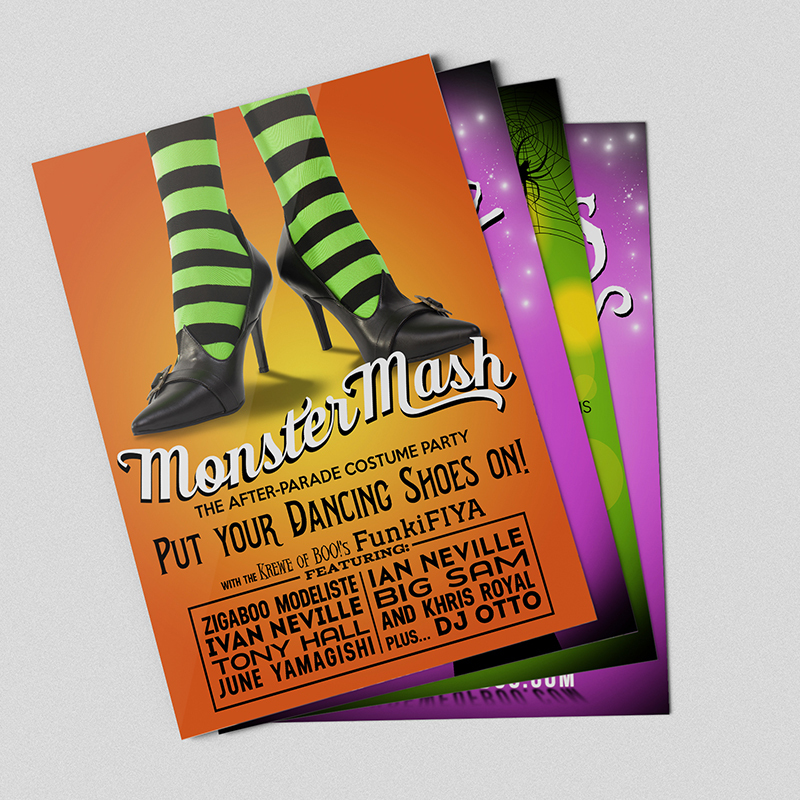 Each year, Midnight Boheme has had the pleasure of designing different artwork for the Monster Mash. Launched in 2017, Brian Kern added a new event on the day of the parade. Early the morning of, the Zombie Run takes place in the Warehouse District as folks dress like monsters, drink cocktails, and get chased by the New Orleans RollerGirls. 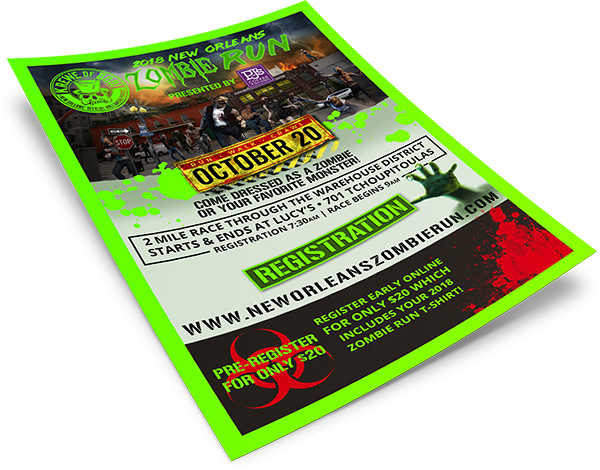 Midnight Boheme designed the Zombie Run website where runners can discover the details and register for the race. Midnight Boheme is a boutique creative graphic design company in New Orleans owned and operated by Laura Kuhn, an independent designer crafting New Orleans graphics from pixel to print. Contact Midnight Boheme via email for design or purchase inquiries at laura@midnightboheme.com.